The 48% - Winchester group is inviting you to take part in an event for EU citizens and pro-Europeans. The Hampshire Welcomes EU! Forum is designed to provide clarity on EU citizens' rights until the UK actually departs from the EU, and the challenges and pressures facing EU citizens at this time. The aim is to bring EU citizens and pro-Europeans together, to be heard, and to fight for their rights. 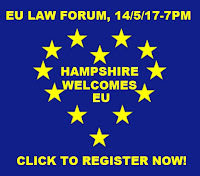 What: Forum: Hampshire Welcomes EU! Cost to attend: There is no cost to attend, but attendees will be asked to kindly provide a donation. While the Home Office website confirms, "there has been no change to the rights and status of EU nationals in the UK as a result of the referendum", the implication that the government will be pursuing a "hard Brexit" means that future immigration and free movement from residents of EU countries to the UK are likely to be curtailed at the very least. Unfortunately, a by-product of the June 2016 Referendum and on-going Brexit preparations has been a rise in xenophobia and hate crime. Employers appear confused about what they can and can't do concerning EU nationals. And while EU citizen's legal status remains unchanged, the rights of EU citizens beyond Brexit have not been guaranteed. As a result, EU citizens resident in the UK have become concerned for their future, and are seeking Permanent Residency and Citizenship. Hampshire, in particular Winchester and Southampton, is home to more than 50,000 EU citizens. Both are pro-European cities. In Winchester, the majority voted to remain in the EU. Constituents across Hampshire have urgent, time-sensitive questions and concerns. Brexit is causing a great deal of turmoil, uncertainty and worry, especially with regard to the position of EU nationals, their families and the single market. While this is a free to attend event, we would appreciate a small donation at the door to help us cover costs. Thank you! Refreshments available from the bar. Not only have we got the local elections approaching quickly, we have now also learnt that there will be a general election on 8 June! To vote in that you need to be registered by 22 May. Simply visit www.gov.uk/register-to-vote to do so. Migrants Organise has a good summary of voting rights and important dates. If you have a local notice board nearby why not download and print this poster (PDF) and have it displayed there! 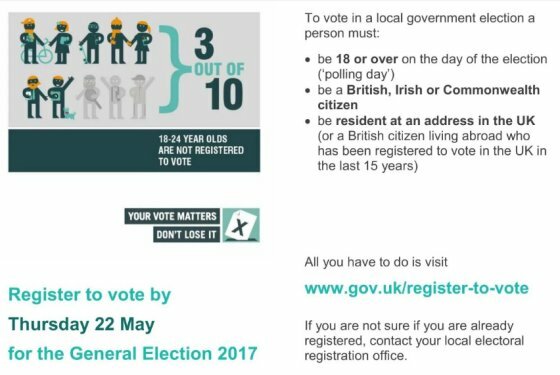 Take part in the Local Elections 2017! 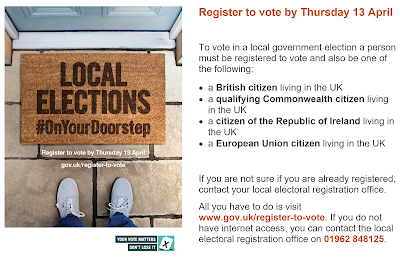 The date for the local elections is approaching fast - many of us can vote on 4 May. However, to do so, you need to be registered to vote by 13 April. This can be easily done by going to www.gov.uk/register-to-vote. If you have a local notice board nearby download and print this poster (PDF) and have it displayed there!